Collagen is the most abundant protein found in living organisms and is made up of eighteen amino acids. With a high tensile strength, it is the main component of fascia, cartilage, ligaments, tendons, bone and teeth. It is even present in the cornea and lens of the eye in crystalline form. Collagen ensures the cohesion, elasticity and regeneration of skin, cartilage and bones. It strengthens blood vessels and plays a key role in tissue development. Maintaining normal Collagen levels in bone, cartilage, tendons and ligaments is vital to maintain joint health. Collagen Peptides is the hydrolyzed form of Collagen. After hydrolysis, the product loses its gelling ability and makes it soluble in cold water. Collagen Peptides is also known as ‘Collagen hydrolysate’. Gelatin hydrolysate’, ‘Hydrolysed collagen’ etc. It differs from other proteins as it contains amino acids, Glycine, Proline and Hydroxyproline in a concentration that is around 10-20 times higher than in other proteins. These amino acids play an important role in building fibrous tissues. An insufficient supply of these amino acids results in painful joints, brittle fingernails & hair and wrinkled skin. Many studies indicate that Collagen Peptides has a preventive and regenerative effect on bones, cartilage, tendon, skin etc. Collagen Peptides also contains all the essential amino acids except tryptophan. Its amino acid composition corresponds to that of the cartilage matrix. 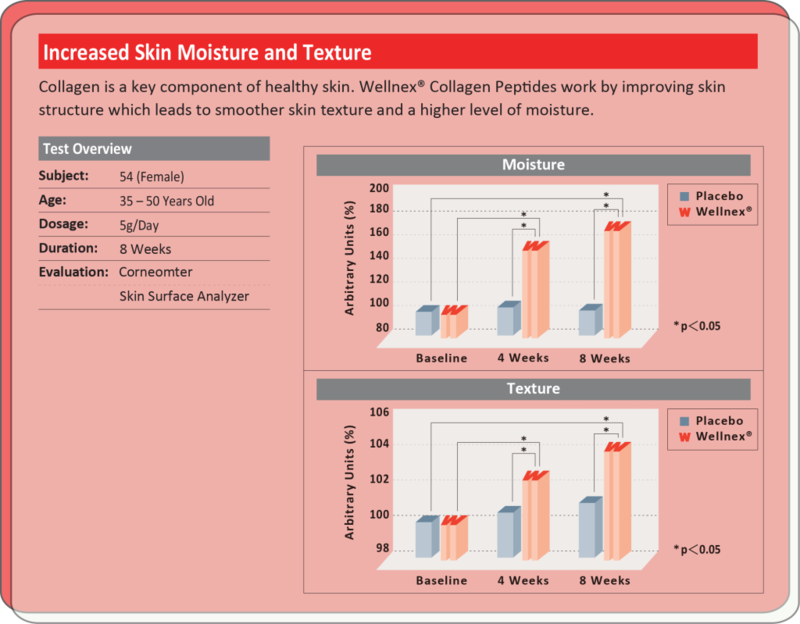 Thus Collagen Peptides is a ‘customized’ Collagen building block. It’s a natural product produced from natural raw material with no reported side effects. It does not react with drugs or other food or food ingredients. Our skin changes over time, leading to visible signs of aging, like a loss of elasticity, increased skin roughness, uneven skin tone, wrinkles and fine lines. Skin is comprised of two layers, known as the epidermis and dermis. The dermis contains collagen and glycosaminoglycans. Collagen provides integrity and firmness to the skin and is responsible for its strength and elasticity. The degradation of collagen in the skin leads to the reduced skin firmness, enhanced photodamage, and to fine lines and wrinkles. As we get older, our body’s natural ability to produce collagen decreases. Healthy radiance begins to vanish, and our skin starts to develop ridges, fine lines, uneven tone and age spots, and looses elasticity and moisture. These signs of aging can be slowed down by maintaining collagen levels in the skin. Since glycine, proline and hydroxyproline are the major amino acids in collagen, replenishing these amino acids may be the key for maintaining collagen levels. Studies have established that collagen peptides are highly digestive and are quickly absorbed when consumed as part of a finished food or supplement. Pharmacological bioavailability trials revealed that two types of collagen dipeptides, prolyl-hydroxyproline (Pro-Hyp) and hydroxyprolyl-glycine (Hyp-Gly), were available at high concentrations for several hours in the human blood stream after oral administration.1)Read more on bioavailability. Pro-Hyp and Hyp-Gly also play crucial roles in maintaining skin health conditions and are key components of Wellnex Collagen Peptides. Osteoarthritis is a degenerative joint disease. It’s caused by progressive destruction of articular cartilage.Joint cartilage mass mostly consists of Collagen and Proteoglycans. The production of cartilage is regulated by specialised cells called Chondrocytes. In the process of ageing Chondrocytes can’t keep up with the natural regeneration process and cartilage starts to break down. Clinical studies indicate that Collagen Peptides stimulates collagen synthesis in Chondrocytes and hence it supports the joint cartilage. The product is gaining wide acceptance across the world as a natural and functional food supplement for joint health without any side effects. Clinical studies recommend that a daily dosage of 10g for three months can be effective and this can be followed by a daily maintenance dose. Being readily soluble in water, it can be mixed with milk, water, juices or any other beverage. Osteoarthritis (OA) and repetitive, high impact activities, like running, are common cause of joint pain and reduced physical function, and partly caused by cartilage degradation and damage over time. Cartilage is a tough and flexible connective tissue found covering at the ends of bone joints. It prevents bones from rubbing against each other and acts as a cushion during movements. Cartilage’s collagen proteins and proteoglycans help cartilage maintain its strength . Cartilage damage and degradation are often caused by aging, obesity, extreme physical work, repetitive high impact activities and injuries. As humans age, our bodies natural ability to produce new collagen declines and new collagen for cartilage is not produced as quickly, leading to joint pain. 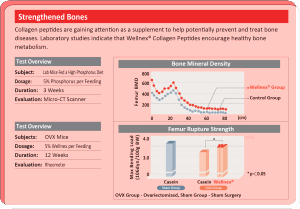 Wellnex Collagen Peptide contain two key di-peptides, hydroxyproline-proline, and hydroxyproline-glycine, These diepeptides may help regulate chondrocyte diﬀerentiation and play a key role in the maintenance of mature chondrocytes in cartilage. 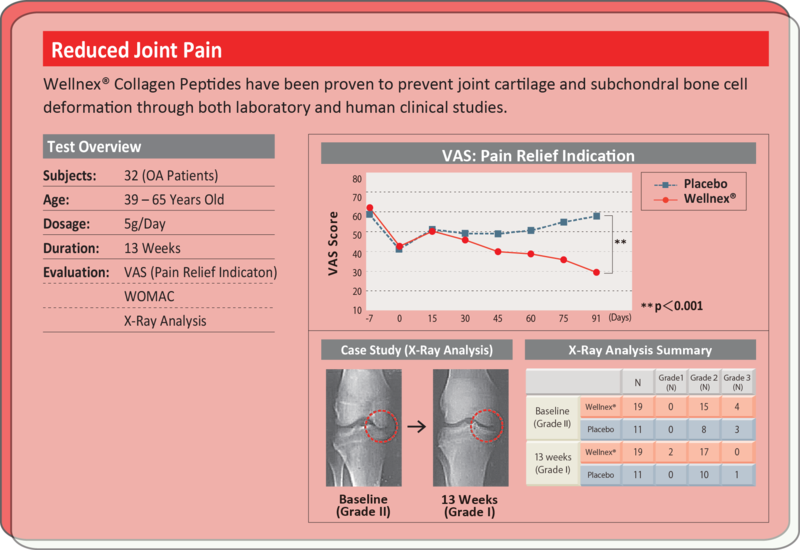 Research suggests that hydroxyproline-proline and its regulatory mechanism explain the therapeutic eﬀect of collagen peptide in improving joint conditions. One published clinical study revealed that 63% those taking Wellnex Collagen Peptides saw excellent or good improvement after 13 weeks of collagen supplementation, where the placebo group showed the opposite results with 63% reporting no improvement at all. Read the published clinical study. 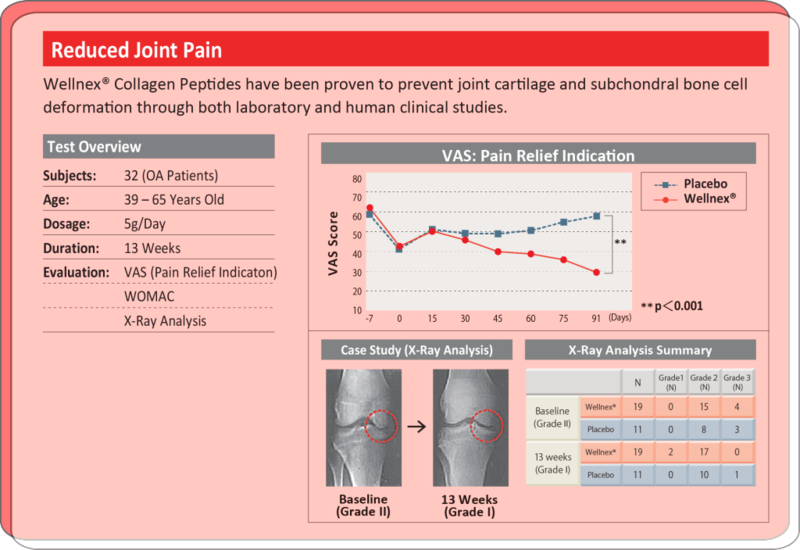 Wellnex Collagen Peptide supplementation promotes accumulation of collagen peptide in cartilage tissue and its subsequent restructuring, leading to reduced joint pain. Bone is composed of inorganic substances such as hydroxyapatite and organic proteins. Collagen is the main organic protein in bones, making up about 30% of the bone’s composition. It also adds quality, as collagen molecules are the network to which other metals come to settle in order to form the bone structure. The perpetual building and rebuilding of the bones’ structure determines the bone density of each individual. As we age, bone density and strength become important issues to maintaining optimal health. Decreased bone density and deterioration of bone microarchitecture, increase bone fragility and susceptibility to bone fractures. The most common fractures are of the wrist, spine, shoulder and hip. Stimulating the osteoblasts, the cells responsible for bone formulation, to build new bone may help restore bone density loss. The two key di-peptides found in Wellnex Collagen Peptides, hydroxyproline-proline (Hyp-Pro)and hydroxyproline-glycine (Hyp-Gly) can induce the differentiation of osteoblasts, in theory leading to increased bone density. 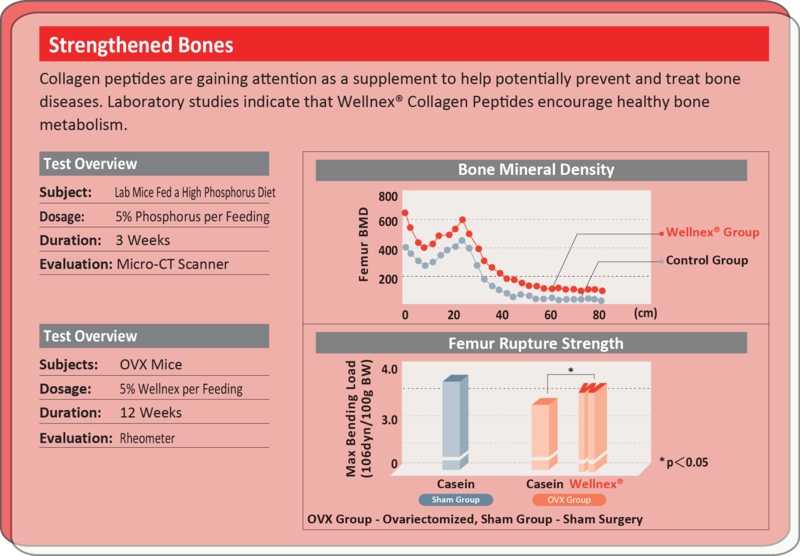 In clinical trials, Wellnex Collagen Peptides increased bone density and increased femur strength in mice. Wellnex Collagen Peptides are a fat- and carbohydrate-free protein source with unique nutritional and amino acid profiles. These elements make Wellnex Collagen Peptides the ideal multifunctional protein source for consumers’ nutritional needs. Collagen Peptides are used extensively as a protein source in everyday foods, sports nutrition and medical/institutional care products. Given that the Recommended Daily Allowance is 0.8g of protein per kilogram of bodyweight and some are less focused on nutrition, protein supplementation has become more crucial to our diets, especially for the elderly. Research suggests that the elderly should consume 1.5g of protein per kilogram of body weight to maintain optimal health1) . These protein requirements can be challenging to achieve, and many rely on protein supplementation to help maintain lean muscle mass as they age. This research exemplifies that lean muscle mass can be retained through protein supplementation with collagen peptides. Wellnex Collagen Peptides can be included in a variety of applications, like liquid concentrates and powders, to meet consumers’ protein needs. Learn more about possible Wellnex Applications: Link to applications page.